Most of the recipes that I share are very easy. This one is too, but it does take a bit more time to put together. It’s worth it though. Moisten the stuffing mix with 3 Tbs. hot tap water (4 or so Tbs. if you are making more than 4 steaks). Spread 3 Tbs. stuffing mix over one side of the steaks. Roll up and fasten with a wooden toothpick. 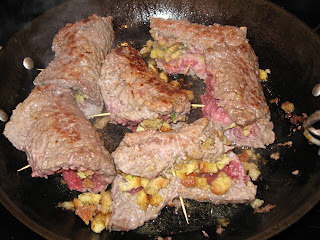 Brown the beef rolls in a large skillet in a bit of oil over medium-high heat. 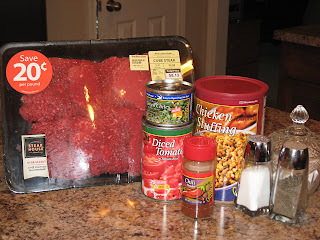 Add tomatoes, chilies, chili powder and 1/4 cup water. Bring to a boil. Lower the heat and cover the skillet, simmering for 20-30 minutes or until the beef rolls are tender. 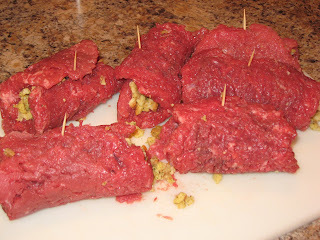 My husband is always telling me he likes cube steaks rolled around stuffing, but I really had no idea how to do that (truthfully, I didn’t work too hard on figuring it out!) so this looks perfect. He’ll love it. Thanks! Those look DEEELICIOUS! Thanks for sharing the recipe! These look yummy! And I just thawed one too many packages of cube steak so I am totally going to try this! This looks delicious! I’ve never tried anything like it before and I know it would be something my husband would love. I’ve never had green chilis. Would that make the sauce spicier than medium salsa (I’m a bit of a wimp when it comes to spicy food)? Do you think it would be ok if I skipped the green chilis altogether, or should I add something else that would be a little milder? I love your site. I’ve tried several recipes to add some variety to our usual rotation, and my husband has declared them all keepers. Thanks! Michelle, I always use mild green chills. I buy mild salsa too, because medium has more kick than we like. So, if you can handle medium salsa, I think you’ll be fine with the chills. So how would you adjust this for crockpot? I love my crockpot since family come in before I get off work. You could either brown them and then put them in the crockpot, or skip the browning. Either way, cook them 5-6 hours on high or 7-8 on low. 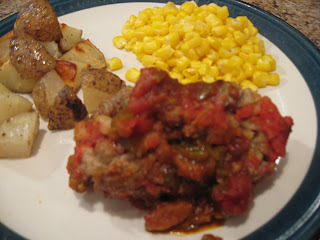 Great idea to try this recipe in the crockpot! Loloks very good! I am wondering if it could be made ahead of time? What are your thoughts, please? Carmen – I asked Tiffany about this and she says it should work. It may just require some tweaking on your part, like a slightly longer cook time. Let us know if you do and how it turned out too!